Let’s face it, life comes with clutter! A wooden garden shed can solve all your outdoor storage problems. It’ll not only provide valuable extra storage space, the natural wood will look great in the garden too. Wooden sheds are available in sizes ranging from 3ft x 6ft to a huge 20ft x 10ft. Prices start at about £140 for a budget overlap shed and can reach over £1000 for a large tongue and groove garden building. Double doors make it easy to store large items whilst two separate doors give increased flexibility. Windowed sheds let the light in for a bright workspace, whilst windowless alternatives provide greater security. Family firm Waltons Sheds have been making sheds since 1878. Timber used in all Waltons wooden sheds is Forest Stewardship Council (FSC) certified and they stand by their quality with a 10 year anti-rot guarantee. This Waltons shed uses 8 mm overlap cladding that forms a strong and water resistant wall. A large single door provides easy access to this storage shed, which makes getting your items in and out hassle free. The shed comes with a window panel which can be installed on the left or the right of the structure as it’s a universal panel. The shed requires DIY assembly, but instructions are clear. You’ll need 2 people to erect the shed. Ideally, you would prepare a concrete base for this shed. But, if you are positioning the shed on soil or grass, Waltons recommend that you stand it on pressure treated wooden bearers (not supplied). The timber is pre-treated with a preservative basecoat but it is recommended that you treat the shed with a high quality preservative during assembly and annually thereafter. This nicely finished shed is just the job if you need some storage space for your bikes, mower and garden tools. 4.5 out of 5. Some customers have reported slight warping to the side panels making assembly more difficult. This 4 x 6 overlap shed is from BillyOh’s budget range of sheds, and as such you can expect good value for money but not super quality. The overlap wall panels give the shed a rustic look, it has two large styrene windows, so it’s bright inside and the apex design means there’s head clearance for most people. Although the assembly instructions could be clearer, with pre-assembled side panels, this shed is reasonably straightforward to put together. If you have a level base prepared, the shed can be built in less than three hours. Obligingly, the shed is supplied with solid sheet board flooring. 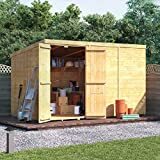 This wooden shed is ideal if you want a low-cost solution to your everyday garden storage needs or need a cheap potting shed. The BillyOh budget overlap shed is constructed using rough sawn, lightweight timber, approximately 5mm thick of the type commonly used in fence panels. 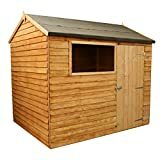 Due to its lightweight construction this shed is only suitable for low intensity garden storage or, as suggested above, for use as a potting shed. The roof felt tacks are a little short for the job, but can easily be replaced with longer ones from any DIY store. 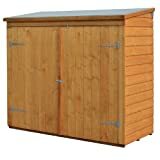 This windowless 6’ x 3’ wooden garden shed from Rowlinson is ideal as a secure garden storage unit for bikes and garden tools. Although compact, there is enough depth to comfortably store two adult bicycles and the double doors allow easy access. The shed panels are constructed using shiplap cladding which is more secure than an overlap design, and we like that the shed comes with a tongue and groove floor and a solid board roof. 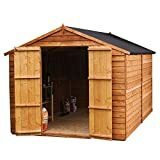 Rowlinson has a solid reputation for making good quality garden buildings and this storage shed is no exception. It looks great positioned against a wall or garden fence. The shed is delivered flat-packed and assembly is straightforward. Assuming you have a level base prepared, 2 people can build the shed in about 2 hours. 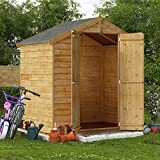 If you need some secure storage space for bikes and the lawnmower, this high-quality and reasonably priced wooden shed from Rowlinson is hard to beat. Although the shed is uncomplicated to assemble for most home DIYers, the instructions could be clearer.